John Kenneth Muir's Reflections on Cult Movies and Classic TV: Ask JKM a Question #2: Timeslip? "Have you seen the 70's childrens British television show Timeslip? (If not, I think you probably would like it, as you like a lot of 60's/70's TV Science Fiction.)" Chris, I have read about -- but had not watched -- Timeslip. 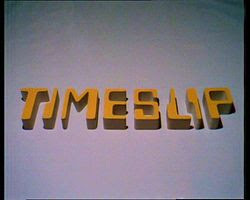 For those who may not be familiar with the series, Timeslip aired in Britain on ITV in 1970 and 1971. Created by James and Ruth Boswell, the program involved two children, Simon and Cheryl, who discovered a phenomenon -- an anomaly -- that permits them to travel through time, to alternate futures and pasts. The series consisted of four multi-part serials. Given the positive critical reception -- the series achieved “top 50” status on both SFX and Dreamwatch lists of best all-time sci-fi series -- Timeslip sounds like a provocative program that one indeed right up my alley, as you say, since I love and cherish 1970s British sci-fi TV (UFO  Space: 1999 [1975-1977], Survivors , Blake's 7 [1978 - 1981], and Sapphire and Steel [1978 – 1981] to name a few). Because you asked about it, I’ll watch the series soon, and either blog the whole thing, or write up a flashback on the topic. John, I agree. British science-fiction television series are truly a wonder. My boyhood favorites that I first encountered in the '70s were Gerry Anderson's Thunderbirds, UFO and Space:1999. For me, those British shows of the 1970s never cease to impress. I'm looking forward to digging into Timeslip! You are in for a treat, I think. I finally saw an episode of "Timeslip" a few weeks ago and the prevailing thought I had while watching was, "this was for kids?!" Good stuff. The Brits have long been better at making SF television for children; or young people. Funny, coming from a country that was known for its "seen and not heard" attitude towards children right up until the 1960s. "Get your school uniform on and shut your gob!" In the States, there is, I think, more an attitude of juvenile SF shows being just smoke and mirrors to sell breakfast cereal. More sugar for the brain, rather than real thought-provoking concepts. A dangerous generalization, perhaps, but seemingly true. Trust the Brits to make more with less money. By the way, I have to say that your affability is much appreciated. You and your site are user friendly. Thank you, first of all, for the kind words about me and my blog. They are very much appreciated. Honestly, I think I've had to step in maybe twice in the last seven years. The readers here are wonderful, and that tally includes you, sir. Like I said in response to your earlier post regarding Star Wars, it's pretty clear that you have an open and keen mind, and that's a terrific thing, especially in such a polarized culture. Regarding Timeslip, I'm tremendously excited about it. The DVDs arrive tomorrow! I can't wait. I agree with you about British shows vs. American shows. That's a generalization, perhaps, that also happens to be true if you look at the evidence. "Make more with less money." - Indeed, that seems a mantra of shows like Dr. Who, Blake's 7, and one of my all time favorites, Sapphire & Steel. I find these programs endlessly intriguing, so I'm ready to get my mind opened by Timeslip!